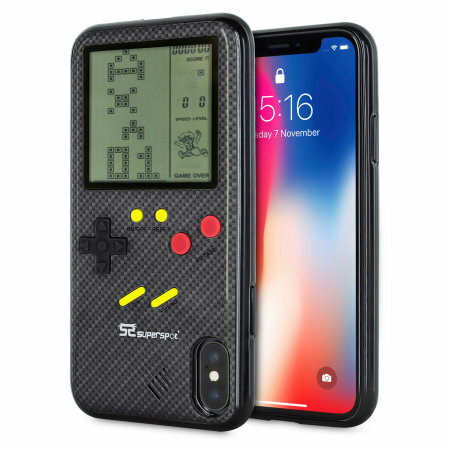 Transform your iPhone X into a classic games console with this Retro Game Case by SuperSpot. 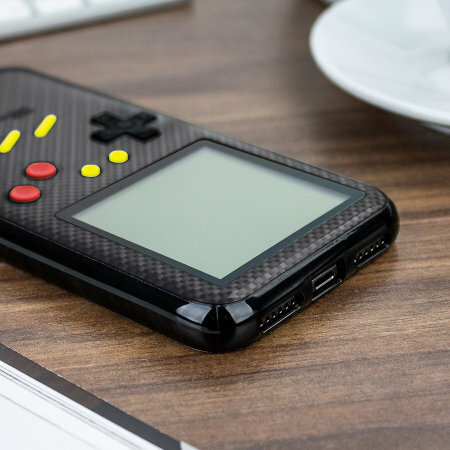 Featuring an original Game Boy styled design, this case in carbon black will keep you entertained for hours while offering excellent protection for the iPhone X. The retro game case by SuperSpot gives you fast access to incredibly fun, retro games that will keep you, your family and friends entertained for hours. 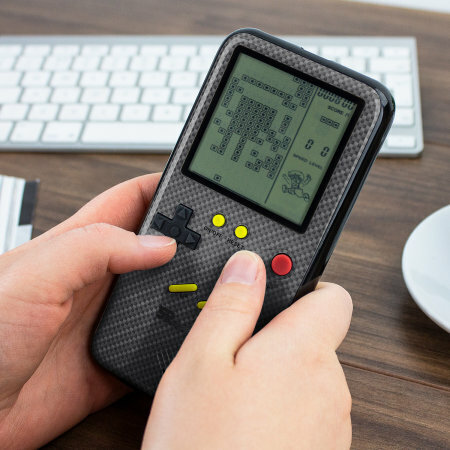 The case has an impressive 2.7 inch screen mounted on the back along with tactile rubber buttons, so that you can play all of your favourite retro pixel games comfortably. 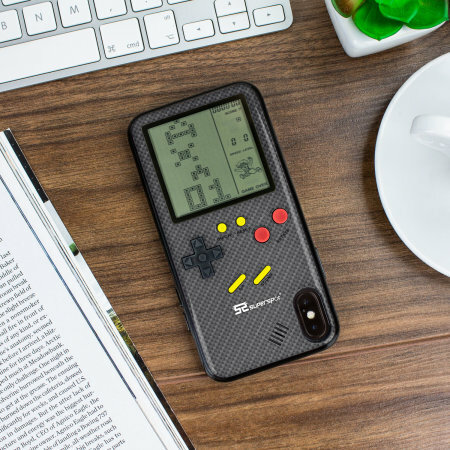 The game case is powered by the provided lithium battery, which will keep you gaming for hours and also features an internal speaker providing a more immersive experience. Tank Battle - Destroy the enemy tanks to win. Dodgems - Weave your way between parked cars. Memory - Much like the classic game Simon, memorise the sequence displayed and play it back to score points. Block shooter - Similar to the all time classic Space Invaders, destroy the advancing blocks before they get too close. Maze runner - Skip through the gaps to make it to the top of the maze. Whack-A-Mole - hit the 'moles' that appear as fast as you can. Block Builder - Fire blocks to clear and complete lines. Matcher - Make shapes corresponing to the falling shapes before they fall too far. Traditional Block Game - Comparable to the popular retro game Tetris, this game requires you to use falling shapes to complete lines before it's too late. There are 17 different variations of this classic game included. The glossy finish of this case from SuperSpot compliments the sleek design of the iPhone X perfectly. 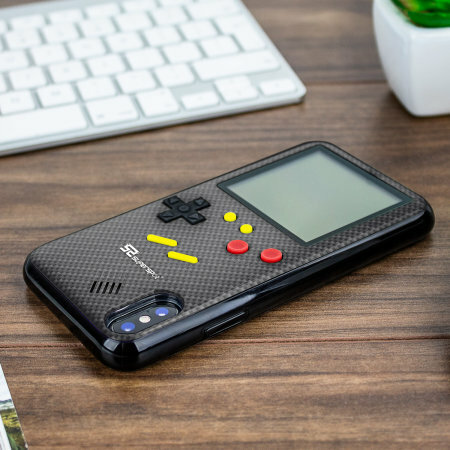 Designed to look similar to a Game Boy, this case gives your phone a 90s retro look that will turn heads and encourage nostalgic smiles. Made from a strong and durable gel material, this case absorbs the shock from heavy impacts such as drops and offers your iPhone X long lasting protection. The unique gel material used has a non-slip coating that provides you with extra grip for your phone, which minimises the chance of dropping your device. Designed specifically for the iPhone X, this case fits perfectly and offers cut outs for the rear camera and charging port and raised buttons for easy access.